It is proved that the Poisson measure is a spectral measure of some family of commuting selfadjoint operators acting on a space constructed from some generalization of the moment problem. We propose the power moment approach to investigation of double-infinite Toda lattices, which was contained in author's article . As a result, we give the main theorem from  in a more effective form. The author earlier in [3, 4, 6, 7] proposed some way of integration the Cauchy problem for semi-infinite Toda lattices using the inverse spectral problem for Jacobi matrices. Such a way for double-infinite Toda lattices is more complicated and was proposed in . This article is devoted to a detailed account of the result [3, 4, 6, 7, 9] . It is necessary to note that in the case of double-infinite lattices we cannot give a general solution of the corresponding linear system of differential equations for spectral matrix. Therefore, in this case the corresponding results can only be understood as a procedure of finding the solution of the Toda lattice. We consider examples of generalized selfadjoint operators that act from a positive Hilbert space to a negative space. Such operators were introduced and studied in . We give examples of selfadjoint operators on the principal Hilbert space $H_ 0$ that, being considered as operators from the positive space $H_ + \subset H_ 0$ into the negative space $H_ - \supset H_ 0$, are not essentially selfadjoint in the generalized sense. In this article we propose an approach to the strong Hamburger moment problem based on the theory of generalized eigenvectors expansion for a selfadjoint operator. Such an approach to another type of moment problems was given in our works earlier, but for strong Hamburger moment problem it is new. We get a sufficiently complete account of the theory of such a problem, including the spectral theory of block Jacobi-Laurent matrices. The solution of the Cauchy problem for differential-difference double-infinite Toda lattice by means of inverse spectral problem for semi-infinite block Jacobi matrix is given. Namely, we construct a simple linear system of three differential equations of first order whose solution gives the spectral matrix measure of the aforementioned Jacobi matrix. The solution of the Cauchy problem for the Toda lattice is given by the procedure of orthogonalization w.r.t. this spectral measure, i.e. by the solution of the inverse spectral problem for this Jacobi matrix. 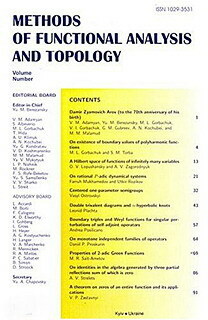 The article deals with orthogonal polynomials on compact infinite subsets of the complex plane. Orthogonal polynomials are treated as coordinates of generalized eigenvector of a normal operator $A$. It is shown that there exists a recursion that gives the possibility to reconstruct these polynomials. This recursion arises from generalized eigenvalue problem and, actually, this means that every gene alized eigenvector of $A$ is also a generalized eigenvector of $A^*$ with the complex conjugated eigenvalue. If the subset is actually the unit circle, it is shown that the presented algorithm is a generalization of the well-known Szego recursion from OPUC theory. The classical power moment problem can be viewed as a theory of spectral representations of a positive functional on some classical commutative algebra with involution. We generalize this approach to the case where the algebra is a special commutative algebra of functions on the space of multiple finite configurations. If the above-mentioned functional is generated by a measure on the space of usual finite configurations then this measure is a correlation measure for a probability spectral measure on the space of infinite configurations. The latter measure is practically arbitrary, so that we have a connection between this complicated measure and its correlation measure defined on more simple objects that are finite configurations. The paper gives an answer to the following question: when this latter measure is a correlation measure for a complicated measure on infinite configurations? (Such measures are essential objects of statistical mechanics). We continue to generalize the connection between the classical power moment problem and the spectral theory of selfadjoint Jacobi matrices. In this article we propose an analog of the Jacobi matrix related to the complex moment problem and to a system of polynomials orthogonal with respect to some probability measure on the complex plane. Such a matrix has a block three-diagonal structure and gives rise to a normal operator acting on a space of l2 type. Using this connection we prove existence of a one-to-one correspondence between probability measures defined on the complex plane and block three-diagonal Jacobi type normal matrices. For simplicity, we investigate in this article only bounded normal operators. From the point of view of the complex moment problem, this restriction means that the measure in the moment representation (or the measure, connected with the orthonormal polynomials) has compact support.